The New Southern View Ezine/Cookhouse Special � Cheese: Milk's Leap Toward Immortality! One can’t help but wonder what was going through the mind of the first person to consider trying cheese. According to legend, an Arab on a cross-desert journey was carrying milk in a saddlebag made from the stomach of a young animal. Stopping for a drink, he was faced with the results of the milk sloshing for hours under the hot desert sun. It had separated into whey (the watery part) and curds (the coagulated or solid part). He must have been mighty thirsty to proceed. Regardless of its origin, cheese production today is a more controlled and definitely much more sanitary process. The Website www.cheese.com lists 652 different types of cheese, but there are thousands of other varieties produced around the globe. 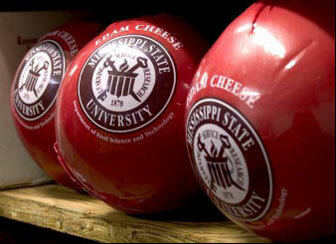 Cheese production is big business, and at Mississippi State University’s Dairy Science Department, the staff, teachers, and students treat it as such. Theirs is a teaching and research facility—a laboratory for students studying dairy foods. And there is an outlet for the results of their work known as the MSU Cheese Store or MAFES Sales Store (MAFES being an acronym for Mississippi Agricultural and Forestry Experiment Station). 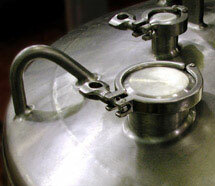 Milk used in the production of cheese at MSU is stored in stainless steel tanks like this one to the left. The store, located on the MSU Campus in the glass annex at the front of the Herzer Dairy Sciences Facility, keeps regular hours from 8 am until 5 pm, Monday through Friday. They close during regular university holidays (with the exception of Spring Break) but remain open on days when football games are played on campus. The history of MSU cheese production began with Herzer and Edam in 1938. In 1938, MSU's Professor Frederick Herman Herzer, head of the Dairy Science Department from 1947 until 1958, decided that a quality cheese produced at the school would “draw attention . . . like our football team,” in addition to the facility itself serving as a teaching and research laboratory. 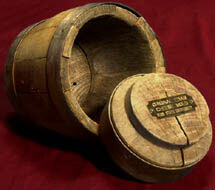 Beginning with ten teakwood hoops or cheese molds (one can be seen at right), hurriedly ordered from Holland just before the harbors were closed due to World War II, Professor Herzer and his department started producing three-pound Edam Cheese balls or “cannonballs” at the rate of a few hundred a year. What followed was a learning process for both the faculty as well as the students, with improvements in both the process and an increase in production. The search for the perfect combination of aging, pressing, and salting methods, plus the technique of dipping the finished product in red wax in order to minimize surface mold growth, resulted in the attractive red MSU cheeseballs that we all know today. Using two 814-gallon vats (shown to the left and below to the right), the staff and students turn out about 272,000 pounds of cheese each year. Twelve years after the end of the Second World War in Europe, the school ordered fifty new hoops from Holland to supplement the original ten, thus increasing the top production level to 54 Edams per day when the dairy herd could supply sufficient milk. Six years later, the average cheese production had increased to 2,400 Edams annually. 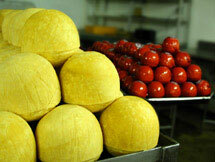 The wooden hoops have since been replaced but Edam is still the big seller. Concentrated frozen bacterial cultures, kept at -80°F prior to use, were implemented in 1970, resulting in a higher quality product. A larger production area in the newly built Fredrick Herman Herzer Dairy Science Facility and additional hoops from Holland, led to an increase in daily cheese production of 165 per day. Demand continued to outpace supply and the plant's packaging area was converted to cooler space in 1973, increasing the storage space to accommodate an additional 10,000 Edams. The installation of two 7,000-pound cheese vats in 1976 boosted Edam production by 300 daily. Further expansion in 2002 increased storage and production. Three-pound Edam “Cannonballs” in their bright red wax covering and airtight Cry-O-Vac plastic bags await delivery on the warehouse shelves. Uncoated Edams can be seen below. In 1946, students were making on average nine Edam cheeses a day; today, six full-time employees and six part-time students turn out about 400 Edams daily with other food science students sharing in the development and production of the cheeses and other food stuffs. This includes all of the fluid milk products, ice cream, and butter that is used on the MSU campus. In addition to the Edam (they produce 50,000 a year now), MSU’s Dairy Science Department turns out three-pound Reduced Fat Edam Cheese Balls (2,000 per year), two-pound Vallagret Wheels, a Norwegian-style of Swiss cheese (7,500 a year), two-pound Cheddar Cheese Blocks (41,000 per year), two-pound Jalapeño Cheese Blocks (7,500 per year), and twenty-ounce reusable crocks of both Cheese Spread and Jalapeño Pepper Cheese Spread (3,200 per year each). Also available from the MAFES (Mississippi Agricultural and Forestry Experiment Station) Sales Store are milk, chocolate milk, butter, 15 flavors of ice cream, various cuts of beef and pork, muscadine juice and jelly, blueberry preserves and honey. To complete your shopping list, the store sells Cat Head Biscuit Mix, Sweet Potato Coffee, assorted Barbecue Sauces, Mild Chow Chow, Mild Pepper Jelly, Five-Pepper Jelly, Picante Salsa, Cilantro Salsa, BBQ Seasoning, Cajun Seasoning, Lemon Herb Seasoning, and Steak and Rib Seasonings. Cheeses can be ordered for Christmas by contacting the store at 662-325-2338 or through the store’s web site at www.msucheese.com. Customers who want to have cheese for Thanksgiving, Hanukkah, or Christmas should place an order before October 15. Cheeses are shipped only in cooler weather from the first of November to the end of April, and Vallagret is shipped only from November to January, but cheeses and other products can be picked up at the store year round. Non-dairy products are shipped year round. And for a bonus, look for the eight pages of recipes on the MAFES website.